Jamal Lowe relived the buzz of his Pompey bow and admitted: It was worth the wait. The Fratton faithful were finally given their first sight of the non-league hot shot as he was handed his Blues bow is the 2-1 win over Leyton Orient. Lowe was introduced in the second half and made a positive contribution with his forward-thinking approach. 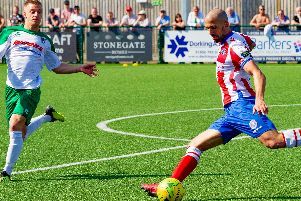 It was a dream moment for the man who returns to the pro ranks after arriving from National League South outfit Hampton & Richmond. The 22-year-old spent three years at Barnet, but admitted he’d never played in a game of the scale of Saturday’s victory. Lowe has had to sit tight after agreeing a deal in October, remaining with his non-league side while training with Pompey. But being patient was worth it after being given the chance to perform in front of a crowd of 16,564. Lowe said: ‘It’s the biggest game I’ve every played in. Waiting for that whistle to blow was something else. ‘I could just feel my legs filled with energy. It’s been a big wait. I guess I’ve been waiting months for that moment to arrive. ‘But it was worth the wait. It was a great relief to finally get out there and play. ‘I can’t say it’s been frustrating waiting because the team’s been doing well. There hasn’t been a need for chopping and changing. ‘I’ve just had to bide my time and when the moment arrives be as ready as possible. ‘The noise is mental. The amount of noise was unbelievable. ‘It just get gives you that extra bit of energy and desire to do that bit for all those people watching. They are here to enjoy the game. Lowe was utilised on the right side of midfield in a 4-4-2 against Orient. Many Pompey fans see the England C international as an out-and-out striker but Lowe explained that’s not the case. He said: Everyone thinks I’m a number nine because of the goals I score. ‘I see the fans are saying they’ve got a new striker – but I’m more of a winger really. ‘I can play up top in a two, though. I can play quite a few positions so hopefully that comes in handy. ‘At Hampton we played 4-2-3-1 and I played on the left or right. Lowe is now looking forward to being part of a promotion bid as Pompey closed the gap on the top three. He warned Pompey’s rivals they will take advantage of any slips. Lowe said: ‘We’re getting closer now. ‘Everyone’s going to be looking and seeing us closing the gap to two points. ‘Last week they got a little break from us, but now I can see us getting a run going. As soon as someone steps off the gas we’ll be there.